Today I joined with Andy Cave to take a group of media writers up Stickyle Ghyl and towards Pavey Ark. They were visiting the Lakes to write about environmental issues and the Lake district. Weather was typically "Lakes" whilst they were here and immediatelly returned to clear skies when they left! We scrambled up the ghyl and admired the views. Hope you have a great long-weekend. I'll be working Sat & Sun on an advanced scrambling course. I've been out climbing in NE Cumbria and also with media people today - but more later when I can download the pictures. I'm not giving too much information for this wonderful isolated crag. It's nice limestone, overlooking the river and with a nearby pub for refreshments. The sandstone base makes for an unusual start to the climbs and scramble back a short distance at the top for tree belays. We ascended Marik; Steph; Double Jeopardy; and Ivy Crack. Enjoy it if you find it, navigate to avoid the small nettle patch though! Headed off to Long Crag to enjoy the rest of the sun. Jane - her first abseil ever. Paula - she won the "Unusual Noises Award". We wondered if there was going to be a new baby born on the crag. I should mention in fairness that Paula is "height challenged" and fought very well and completed the climb. Jane, setting off up a climb, with Nicole checking her knee for grazes. 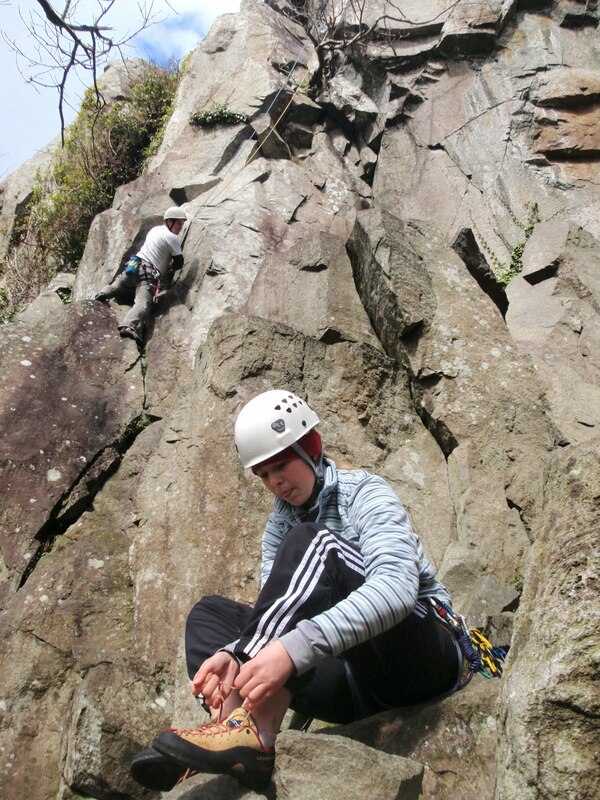 The recent dry weather meant Pavey came into condition and many routes were climbed. Unfortunatelly this morning's rain has probably made the crag damp again. Photos are of the Stoat's Crak / Rake End Wall area. Glorious day out with Paula, Sue, Jane, Nicole and Sarah. We started the day scrambling up a ghyl near to where they camped overnight. The riverbed was dryer than I've seen it before which allowed us to ascend water shutes and explore areas I've not been to before. A bit of ropework for extra confidence & security allowed everyone to climb some challenging ground. Frost on the car and blue skies today. Weather looks good for Thu, Fri, Sat with cool nights and dry days across Cumbria & Snowdonia. Warmer at the weekend. If you're planning to get out in the Lakes or Wales this weekend then Saturday should be the better day as rain might arrive on Sunday morning. Taken her husband & friends scrambling & wild camping weekend including Scafell Pike. Family weekend with their 2 children scrambling & rock climbing, including Crib Goch and Snowdon. 4-day winter skills trip for 5 friends, enjoying winter conditions in the Cairngorms, Aonach Mor, and summitting Ben Nevis. Supported their charity walk of the Yorkshire 3 Peaks (Ingleborough, Pen y Ghent, Whernside). Saturday will be another day of adventure with 5 ladies (they've promised to behave.... a little bit) we've planned a ghyl trip followed by a scramble and some short rock climbs. Suncream, water, rock, and great laughs. A nice dry day today in the Lakes. It was 5 degrees early this morning as I took the dog out for a jog, and 4 degrees at 9pm. Although sunny it remained cool throughout the day; expect a light frost under clear skies tonight . Made the most of the light and climbed a route above the Old Dungeon Ghyll pub; Odin (VS 4c, 4b), is a pleasantly challenging route located just left of Evening Wall, a classic Severe. It started to turn chilly at 7pm and an hour later, as we headed down in the decending darkness, we called up to a party on Pluto, a fantastic HVS 5a (but not a route to climb in the dark!) and saw another party on Middlefell Buttress, a Diff with lots of big stances which make it a great route for instructing, learning to lead, practicing route navigation, and placing climbing protection. There's a strong half-moon tonight and the climbers should all be in the pub cuddling a beer by now. Borrowdale - Black Crag - The Shroud (VS) & something dirty & green! A dry but but chilly forecast, following some dry & warm days in the Lakes, means drainage lines should be dry, but head for low down crags until it gets warmer again. We arrived at Black Crag before 9.00 to find a party high up on the crag and another pair at the bottom who shouted "Hey is that Roger"... It was Henry who'd been in Tien Shan with me a couple of years ago (see old Blog). AVOID - Gleaned Grooves(VS) on the right of the crag (and Holly Tree Corner) as it's very mucky. We were forced to join the crowds on Troutdale Pinnicle by the incredible amount of moss and dirt - a route for plant enthusiasts. Next I led Steve up The Shroud - a recommended route. 1. The Shroud, VS 4b, 4c, 4c is very good, the upper 2 pitches haven't seen a lot of ascents but you can string pitches together into 2 long ones (bring lots of extenders). 2. Troutdale Pinnacle, S (but not recommended as a first Severe lead, it needs an awareness of protecting traverses and has some invigorating moves). Weather looks excellent on Friday, clear dry and sunny. Saturday - another very fine day. Sunday - looks like there could be some rain in mid/late morning, which will also bring a reduction in temperatures. Conditions look excellent for Rock Climbing and Scrambling, especially on ridges. Cliffs with a lot of moss and drainage might still be damp but remember to take suncream and a warm jacket for a great day out. If you've been driving on the M6 Junction 36 (South Lakes turning) and wondered what the craggy hill is just to the East, it's Farlton Fell, a popular place for Paraponting (that's a scary sport! ), Mountain Biking, short Walks, and Rock Climbing. The steep and obvious "nose" in the col, and visible from the car, contains "Rose Amongst Thorns" VS 4b and Avoidance HS 4a - these were our routes tonight. If you're on Farlton it's well worth walking to the top and a few hundred meters North for spectacular views down onto the roads, across to the Lakes, across the sea and Morecambe Bay to Barrow and to the Yorkshire National Park peaks of Ingleborough etc, fantastic! Martyn has set off with Andy Cave for some filming in Scotland. But before leaving he scoured South Lakes and other parts of Cumbria for a microphone that would work in windy conditions. Unfortunatelly the only one he could find was ill tempered and tried to attack him. I calmed it with a piece of chocolate which, for anyone knowing my chocolate addiction knows that was a huge sacrifice! Fantastic weather in the Lakes, the snow & ice climbing has gone from Cumbria and the rock climbing season has arrived, but there are still patches of snow in the gullys making for fantastic views. Steve and I headed up to Gimmer to climb multi pitch routes to the left of the Cracks (mentioned in Classic Rock), followed by Ash Tree Slabs Direct, a nice VS 4b taking a direct route up the slab. We met up with Mark, an instructor from Scotland, who climbed 3 classic Gimmer routes with a client from Climb 365 . The weather looks good for the rest of the week, possibly turning cooler but staying dry. Maybe an opportunity to climb winter routes on Ben Nevis and rock routes in the valleys? Above the climber is on and E4 to the right of Merlin, a superb HVS climb. We were heading rightwards on the slabs to experince a sunny Severe with nice friendly belay stances! Tremadog is a superb and easily accessable climbing venue. There's a cafe and car park within 2 minutes of the crag where non-climbers (and relaxing climbers) can enjoy a snack or meal. There are a huge number of climbs here, almost all of them enjoy fantastic views out over the fields to the sea, and Tremadog is well known for often being dry and sunny when it's wet and cold everywhere else. There is also a hidden "Upper Tier" - a good beginners and group climbing venue. Back at Idwal Slabs on Ordinary Route learning to lead. The views driving up into Ogwen Valley, Snowdonia, were almost Alpine. It was much warmer than it looked and we headed up to Idwal Slabs where we practiced placing rock climbing leading gear and retreavable abseil retreats. Yes, there was snow at the bottom of the route and it snowed whilst we were climbing but Laura was warm and comfortable. She almost seemed dissapointed at the suggestion to "retire" for a warm drink and cake.